A study into the subtle nuances of bleached white oak, pale marble, and limestone, this 3,120 square foot space is reminiscent of a luxury yacht set in the clouds. The penthouse suite overlooks the Marina Del Rey Harbor and boasts floor-to-ceiling windows. It provides a generous three bedrooms and three and half bath home with a full kitchen and laundry. The two ocean facing balconies offer breathtaking views of the Pacific. Upon entry, visitors are immediately drawn into the south facing sun drenched living and dining rooms where the crisp clean Japanese inspired details are complimented by plush leather and delicate fabric seating in a neutral and pale palette. When not gazing through the floor to ceiling windows at the sparkling sea or the twinkling city lights, the focal point of the room is the stunning Texas Shellstone limestone and bleached white oak clad fireplace. A state of the art Bulthaup kitchen marries vertical grain bleached white oak with pure Calcutta Statuary marble to create the rich and modern heart of the home. 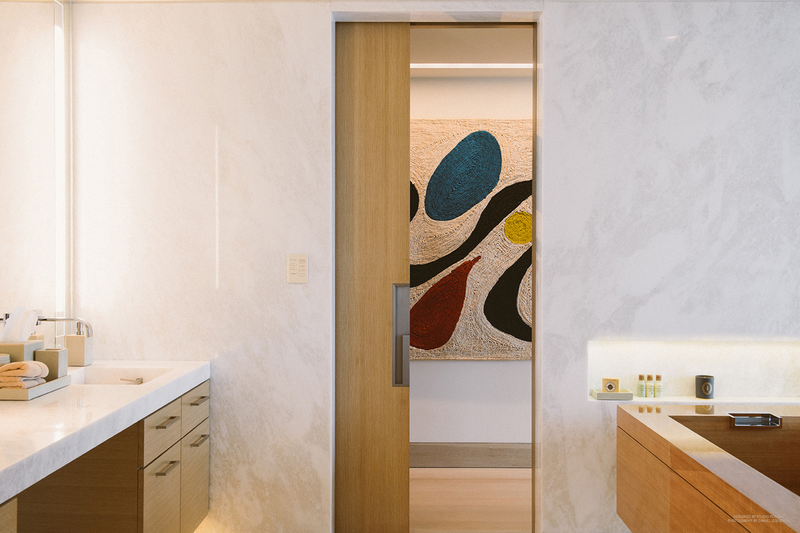 Spaces are connected by mechanized, sliding, rift sawn bleached white oak doors which are fitted with custom designed oil rubbed bronze pulls that seamlessly marry beauty and function.